Ferrari’s Sebastian Vettel, who started from third on the grid, got off the line better than Mercedes’ Valtteri Bottas, but Bottas pulled ahead again heading into Turn 1. Vettel then out-braked himself, running into the back of Bottas. The collision saw Vettel severely damage his front wing, while Bottas sustained a puncture and spun. It was the first instance of lap-one mayhem, as the run down to Turn 3 proved equally chaotic with Pierre Gasly running into the back of Esteban Ocon, causing both Frenchmen to retire. 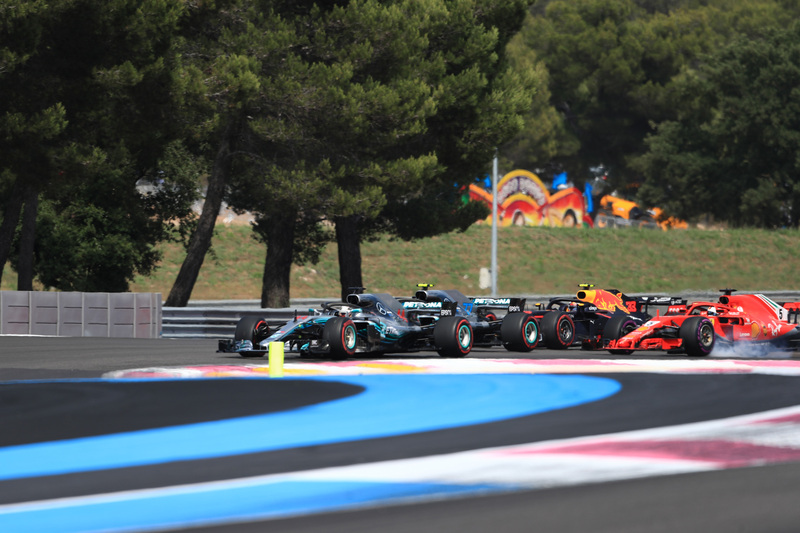 The collisions prompted the safety car being called into action, with Vettel and Bottas both boxing under caution and rejoining in seventeenth and eighteenth. Following the restart heading into lap six, Hamilton consolidated his lead, as he would control the race throughout. 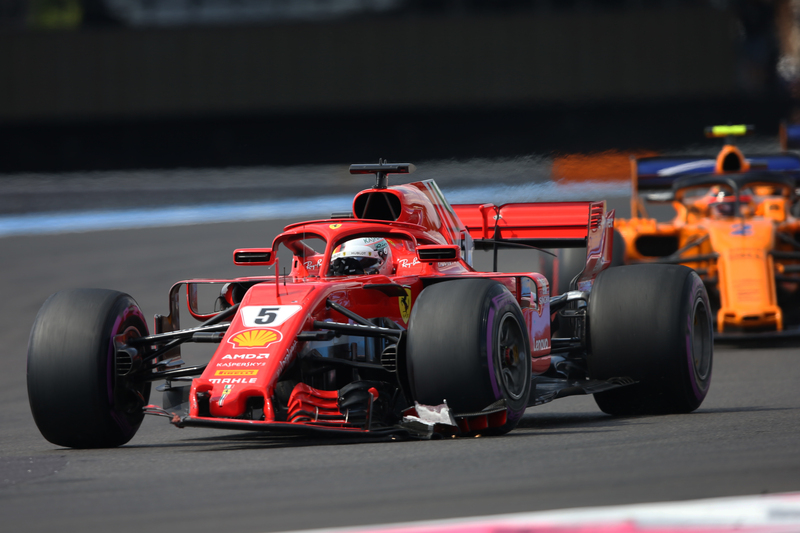 Most of the initial action took place further back as Vettel and Bottas—who suffered a lack of performance following the first-lap collision—made their way forward fairly quickly due to the speed difference between the three top teams (Mercedes, Ferrari, and Red Bull) and the rest. Vettel marched on to crack into the top ten on lap eleven, overtaking Nico Hülkenberg in the long Turn 11 right-hander. It was one of the better overtakes of the race, with the majority of passing being done using DRS on the long Mistral Straight leading up to the chicane. A lot of the moves thus looked fairly easy and straight-forward. With Hamilton in control at the front and Red Bull’s Max Verstappen steady in second, the second half of the race turned into a battle for third between Räikkönen and Ricciardo, with Vettel effectively out of contention for the podium as he was handed a five-second penalty for his part in the collision with Bottas. After quickly making his way past a compliant Vettel on lap 40, Räikkönen—who had run a long first stint—used his quicker Supersoft tires to rapidly close down Ricciardo, who was on the slower regular softs. The two dueled for a bit on lap 46 before Räikkönen slipstreamed Ricciardo using DRS on the Mistral Straight and passed him on the outside under braking for the chicane. With the fight for the podium decided, Ricciardo finished in fourth while Vettel ended up fifth, collecting ten points. As Hamilton took 25 for the win, the Briton has reclaimed the championship lead. Hamilton now has 145 points while Vettel has 131. Vettel and Bottas made additional pit stops late in the race, with a delay with the right rear dropping Bottas from sixth to ninth. 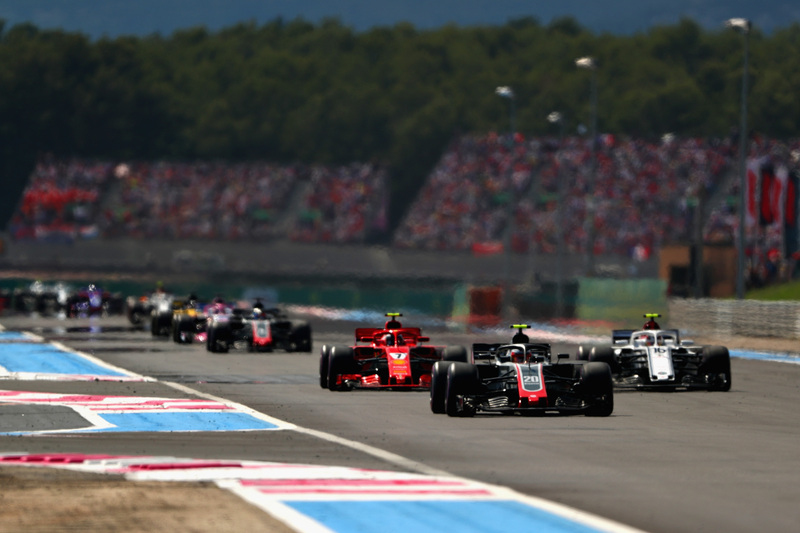 The Mercedes driver made his way back to seventh, but with the race ending under the virtual safety car after Lance Stroll ended up in the run-off due to a puncture, Bottas couldn't attack Kevin Magnussen, who secured a solid sixth place for the American Haas F1 squad. The Renaults finished in eighth and ninth. Sauber's impressive rookie Charles Leclerc claimed the final point in tenth. Romain Grosjean ended up in eleventh in the second Haas following an eventful race. 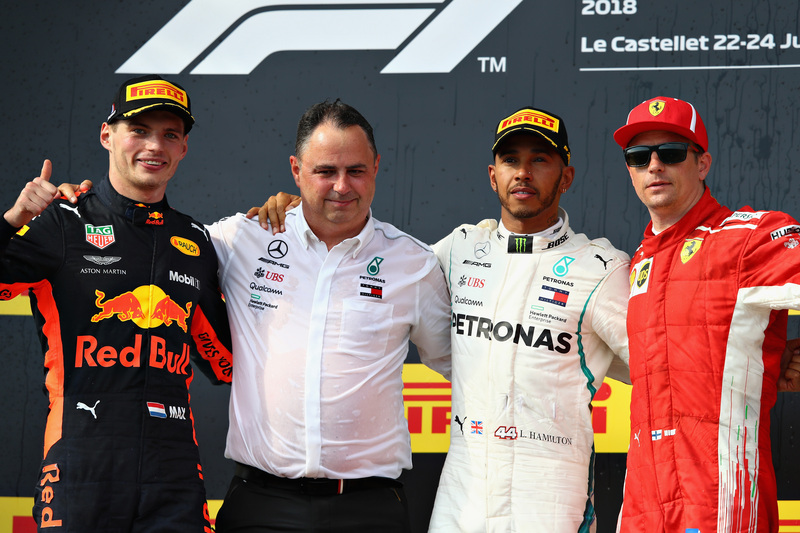 Stoffel Vandoorne finished in twelfth, with McLaren teammate Alonso retiring on the penultimate lap, marking the end of a dismal weekend for the under pressure McLaren. The four-time world champion will start from P1 during Sunday's French Grand Prix. The German is now one point clear of Lewis Hamilton in the Drivers' Title standings. Twenty drivers. Ten teams. One guide.